Bassett’s releases have appeared on a variety of independent labels including Hospital Productions, Utech Records, Volcanic Tongue and No Fun. Although Bassett has released a number of recordings on her now-retired Heavy Blossom imprint, she continues to showcase Zaïmph and other aesthetically allied projects on Yew, a label she founded in 2012. As a co-founder of Philadelphia’s shambolic psychonauts un, tectonic drone pioneers Double Leopards, and the psych-folk drone trio GHQ, Bassett is deeply entwined with the American noise underground, and has mapped regions still only dimly understood by subsequent sonic travelers. From 2003-2008, Bassett joined Matthew Bower in Hototogisu, where her mastery of cacophonous eardrum shred achieved monolithic proportions. 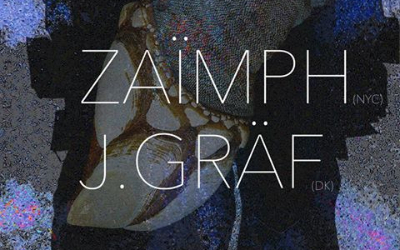 In addition to her solo project Zaïmph, Bassett collaborates with a wide spectrum of musicians including Samara Lubelski, Barry Weisblat, Andrew Lafkas, and Helga Fassonaki. Jenny Gräf is a sound, video and performance artist who explores peripheral places and states through composition, improvisation and participatory works. In Gräf’s music and art she invokes immersion and rupture to explore changing perceptions of diegesis and space, formal choices rooted in a deep interest in social roles and behavior.